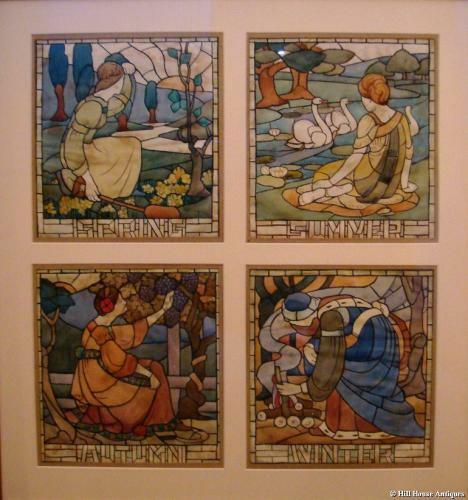 A good set of four (framed together) Arts & Crafts original watercolours depicting the seasons; entitled Spring, Summer, Autumn & Winter. ESK (Examined South Kensington) blind backstamp and further signed E Doyle; c1900. “ESK” implies that these drawings were entered (usually by skilled final year students) for examination at The South Kensington School of Design, which subsequently moved to the present Victoria & Albert Museum site in 1857. Final year students of the School of Design were expected to produce decorative designs for flat patterns for applied arts e.g. plates, textiles and stencil designs for wall friezes. h: 11” w: 50” inc frame.